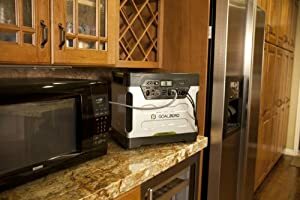 Home » Solar Generator Reviews – Which One is The Best? 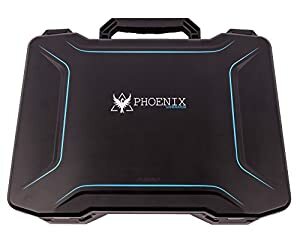 So you’re on a lookout for a portable solar generator capable of powering up your laptop, smartphone, drone or GoPro camera while you enjoy the great outdoors. A good solar power generator can help you accomplish this as long as you take a few considerations into account before getting one. Depending on the number of panels and batteries used, a solar powered generator can power anything from small appliances and laptops to entire households. However, in this guide, we are only going to focus on small portable solar generators designed for camping and other similar outdoor use. You will see our recommendations for the 10 best portable solar generators and learn how to choose the right generator for your specific needs. Jackery Explorer 160 is a really awesome little portable power generator. It is very small and weighs only 3.84 lbs. You can easily carry it with one hand. It is an ideal choice for camping and other outdoor uses. As you can see one full charge give you quite a lot of power to charge the portable electronics belonging to you and your camping buddies. It has one AC 110V Outlet accompanied by 2 x USB-A, 1 x USB-C and 1 x DC Port. This means that you can plug in all those small devices at once. You need to purchase solar panels separately. These foldable solar panels from the same manufacturer do the job well. They weight only a little bit more than 8 lbs. On the other hand you don’t have to rely solely on solar power to recharge this power station. You can also easily use the wall socket or a car outlet. By doing so you would shorten the charging time to around 5 hours. Bear in mind that you can’t plug in any device which requires more than 100 running watts. This means you can’t power-up your portable fridge or freezer. One thing I didn’t like is that you are not allowed to take it onboard the plane. Sorry people, road trips only. However, this is just a generic safety regulation issued by TSA rather than anything wrong with this particular generator. Overall if I had to spend a few days in the wild totally off the grid and get some great footage from my GoPro and the drone – I would totally go with Jackery Explorer 160. It’s a very convenient power station and does its job extremy well. That’s why I put it on top of the list of my favorite solar generators. 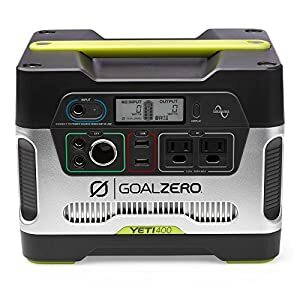 The Yeti 400 from Goal Zero is a compact portable solar generator that is strong enough to run things like laptops, CPAP machines, lights, mobile devices, and even some smaller appliances. It includes a 1.5 amp USB port, a 12V outlet for plugging your devices into, and a built-in 300-watt power inverter, which converts the solar energy into an AC electricity. In addition to using the sun to charge, this generator can also be charged through a standard wall outlet or car charger (not included in the kit). The best solution is to obviously go for the dedicated Yeti solar panels to increase the charge capacity. Connecting them to the unit is very simple. At 29 pounds, this generator is hefty enough to feel durable, yet not too heavy to move it around. Obviously, it is a bit too heavy for multi-day trekking. However, for those mainly travel by car, it is a viable solution. The pop-up handle and stackable shape make it a good choice for camping. The futuristic design incorporates a metallic bright green that we really like. It’s also nice that this kind of portable solar generator can be used indoors because it doesn’t create any fumes or bad smells. Seeing what people who bought this generator have to say about it on Amazon, it’s apparent that most people agree it’s a great choice. This is gotta be one of the most interesting portable solar power generators I have seen so far. Most of the generators and power stations come separately with the solar panels. Renogy Phoenix has got them integrated inside its body. The whole thing looks like a suitcase you can easily carry from one place to another. You’ll certainly agree that this is a truly awesome idea. But how does it work in practice? First – with its 150 running watts it is certainly powerful enough to recharge most of your portable electronic devices. These include laptops, iphone, cameras, drones etc. Fully charing Renogy Phoenix only once is enough to provide enough electricity to recharge things like smartphone multiple times. You and your friends can easily leave it in your camp for charging during the daytime and come back later at night to charge all electronics at once. This kit has got multiple power outputs to make it possible. The built-in solar panels work totally fine. These are a real solid construction, not some cheap plastic foldable gadgets made in China which do not really work. One question you might have is – isn’t it too heavy to carry around? Well, since it weights a little bit less than 13 lbs it is certainly not something you would like to constantly carry around on longer hikes. However, it is definitely lightweight enough to make it possible to move it on short distances such as between the tent and the car etc. In case your power demands are a bit higher – you do not have to rely only on the built-in solar panels. There is nothing preventing you from charging this power kit at night by eg. plugging it into the car or RV socket. Another solution is to simply buy separate solar panels. Since it is an expandable construction, they’re gonna work with this model adding to the total charge capacity. Overall this is a very interesting and versatile portable solar power generator. If you need an all-in-one solution for your outdoor uses I could honestly suggest you give it a chance. Here is the solar generator for whose need something a bit more powerful. While most of the portable solar kits operate in the 100-200 wattage range, this beast can provide up to 500 running watts. This allows you to charge things most of the small solar gens can’t handle such as a 32” LCD TV. I personally found it a great solution for most of the outdoor power needs. Charging multiple small electronics such as MacBooks or ipads is not an issue at all. On the other hand, note that this generator is still NOT suitable for job sites or for powering kitchen appliances. You won’t be able to use it to run things like drills, cookers, kettles or induction cookers. I am truly impressed how light this solar generator is given its higher wattage. 7.05 lbs is really not a lot. You could easily lift it with one hand and move it around without problems. Of course, the dedicated solar panels have to be purchased separately, so take it into consideration. Overall it’s a really good and powerful solar generator which can be used both for things like camping and as an emergency power backup source for the office. Since solar power is 100% clean, unlike in case of conventional generators, you can use it indoors. For example, if you one of your relatives, friends or patients requires CPAP, this kind of generator could be used to provide the power for it in case of sudden blackout. Rockpals Portable Solar Power Station is IMHO one of the best solar power generators money can buy. What’s so special about it which makes me think so? First – it’s lightweight. 7.3lbs is not a massive figure and makes it easy to carry it in one’s hands. It has a nice sturdy red handle which makes it even simpler. A great treat especially for people going camping but also for pretty much anyone else. Second – it provides a quite decent amount of running watts. 300 watts is more than enough to run your laptop, mobile phone, Ipad and a portable camping light – all at once. Third – it comes with several different types of cables and charges which make it more versatile and decrease your reliance on solar power only. These include a 12V car charger and a 110V wall charger. By plugging it into your car or a wall socket you can fully recharge this generator in less than 7 hours. It is 100% safe for indoor use. Patients who rely on CPAP could heavily benefit from having such a generator in place in case there’s a sudden blackout. In the event of a weather disaster such as a hurricane, you can plug into the wall socket to provide the electricity for the CPAP system. You can then set up a conventional portable generator outside to provide power for the house. Overall I like this generator just as much as some other models I’ve mentioned here. It really serves its purpose well as long as you do not try to plug in any higher demanding appliances into it. It is certainly not a suitable solution for powering things like AC or refrigerators for which you would ideally need an inverter generator. I found the Goal Zero Yeti 150 to be a versatile solar power generator that is easy to assemble and use. 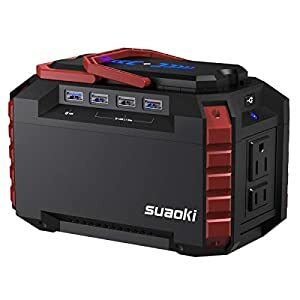 This is a small “plug-and-play” generator designed for camping, emergencies, or any time you need backup power for phones, lights, laptops, or other compact electronics. The system includes a 12V battery with a charge capacity of 150WH/14,000 mAh, which can be charged via the included solar panel or a traditional socket. I like the fact that the Yeti 150 unit can be used inside the household or in the vehicle because it doesn’t put off any fumes and its light and small enough to take anywhere. The main unit has a convenient pop-up handle and the shape makes it easy to stack multiple units atop one another. The Yeti 150 also includes a single USB outlet (2 amps) as well as a built-in 80 watt AC inverter. 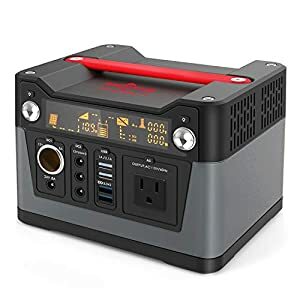 Given its limited capacity (as it is the case with most solar generators, I found this device ideal mainly for light intermittent use while traveling, or as a go-to backup during emergencies. Aesthetically, the colors and materials have a very modern and polished look, and the device feels lightweight and durable with a comfortable grip. This portable power station is a bit stronger than some of the other models presented in this guide. At 500 rated watts, it is potent enough not only to run the small gadgets like smartphones but also to power slightly larger electronics or appliances. For example, you can use it to run a mini fridge for nearly half a day. Electric guitar players who make money busking or simply like to have an opportunity to practice when there’s no steady source of power available should also have a look at this generator. One single charge is enough to provide a constant supply for an electric guitar for nearly 24 hours. It’s also noiseless so nobody will have to listen to the sound of the electric motor while you impress them with your licks and solos. It comes with 2 USB ports, 2 x DC and 2 x AC outlets and a 12V car port which allows you to charge it while driving. As you can see plugging multiple devices is not a major deal as long as you don’t exceed the total running wattage. EF Ecoflow has got a nice digital display showing clearly how much battery you have left. The only minor issue with this model is that it’s a bit heavy. While 10.8 lbs is not that much, there are other solar generators rated at the same wattage which are more lightweight such as Aeiusny 500W. On top of that do not forget to add the weight of the solar panels. 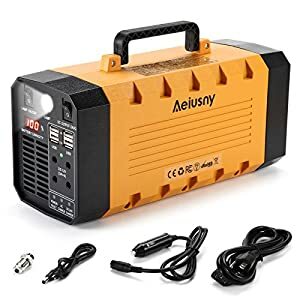 I would recommend this generator for like the road trips in more remote areas and do not plan to carry it around too much. It’s best used when either charged in the car or in a very sunny area. Suaoki is a trusted manufacturer of portable solar generators and this model does not disappoint. It has all the necessary usual features you would expect from a portable power kit. These include several USB ports catering for portable electronics as well as 2x DC outlets. It has 600 surge and 300 running watts. 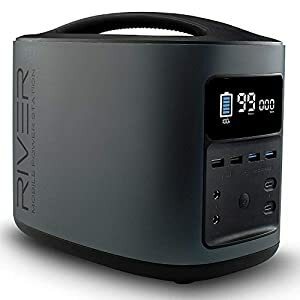 While this is certainly more than enough to supply most of the electronic equipment you would want to use during a camping trip, I wouldn’t really recommend it for this particular purpose. Why? That’s because at 12.35 lbs it’s simply a bit too heavy. Add the weight of the solar panels and you’ll quickly realize that this is not the ideal hiking companion. There are lighter models offering the same wattage and good price/quality ratio. On the other hand, Suaoki can prove really useful in other circumstances such as office and office. Unlike typical portable generators operating on gas, this one can be safely placed indoors as it doesn’t release any potential toxic fumes. This is one of the best features of solar generators and this model is no exception. If you don’t want to rely purely on solar power you can also plug this generator to the wall socket. Rockpals is one of my personal favorite manufacturers of solar generators. The stuff they make is really top notch quality and a lot of people who had the opportunity to use their solar kits would agree with me. It is almost unbelievable how lightweight their generators are and how much wattage they can deliver at the same time. This particular solar power generator can deliver up to 250 running watts of continuous power. To put things into perspective – you will find it strong enough to power all the usual electronics you take with you when traveling. Laptop, smartphone, camera – you name it. You might wonder if it is not potentially harmful to a solar generator to leave it for charging for long hours in the scorching sun. Well, while you should definitely give it a break from time to time, this model comes with built-in temperature control and the protection system which prevents overheating. It takes slightly less than 10 hours to fully recharge it in full sun. This, however, implies you buy the solar panels from the same manufacturer. Results might differ with other panels. 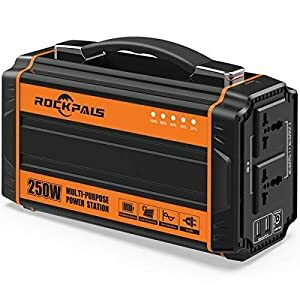 Since you might need to purchase an adapter if using panels from other company, I would suggest to save yourself some hassle and go with the Rockpals solar panels, especially since they are offered at a very similar price as in case of their competitors. Overall it’s a good solar generator for a variety of uses, traveling being probably the most attractive one of them thanks to its low weight and small size. This solar generator differs significantly from others reviewed in this article. That’s because it is a much larger model, definitely not suitable for recreational outdoor use. There’s no way you would benefit from it on the camping trips. Why did I decide to include on our list of the best solar generators? Simply because it performs exceptionally well as a home backup alternative. 1250 running watts is really a lot for a solar generator. This is already the threshold at which you may use it to provide power for a refrigerator. It can also be used for an RV. While of course much bulkier than most portable solar generators it is still not that hard to move around. It has built-in handles and wheels allowing you to pull it behind you without major difficulties. 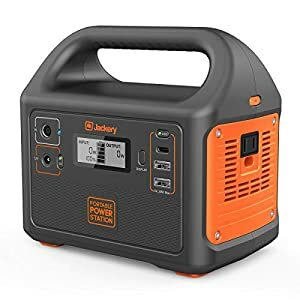 If I were you, I would consider getting this generator if you are not satisfied with how much power most of the portable solar power generators can deliver and want something much stronger. Otherwise, your money would be better spent on smaller models. Especially since that this one doesn’t come cheap either. Why Should You Get the Best Solar Generator? The most obvious advantage solar generators have over fuel-powered generators is that they’re the “green” eco-friendly alternative. The ability to harvest power without fuel is not only better for the environment, it also equates to no ongoing costs associated with purchasing gasoline, propane or any other fuel source. This not only saves the owner money on electricity bills in the long-term, it also provides a reliable and independent method of power generation that relies merely on sunlight and the proper functioning of its parts. 1. Generates cheaper energy – If you calculate the cost of electricity per watt over a 5-year period, even with maintenance accounted for, solar generators are always exponentially cheaper than fuel-powered generators. 2. Decreases utility bill and grid reliance – Even if your panels only produce enough output to cover 25% of your home’s electricity needs, that would still be a sizable chunk of the energy bill each month. 3. Smaller portable solar generators are perfect for camping – There is a wide range of portable power generators being especially useful for camping. 4. Neutral carbon footprint – Solar generators won’t produce any greenhouse gases or byproducts that are harmful to the environment. 5. Suitable for summer use – Solar generators thrive in the summer sun, and since they do not emanate heat they can be used in hot climates without causing discomfort or heat-related fire hazards. 6. More compact and portable – Even the smallest fuel-powered generators are bulky in comparison to the slender panels and flexible setup of the best solar generator. 7. No potentially deadly fumes – Fuel generators need to be used in well-ventilated areas to prevent a buildup of potentially fatal carbon monoxide fumes. Solar generators carry no such risks. 8. More reliable when fuel is not available – In times of emergency, when fuel is not easily accessible, solar generators will still be in use. 9. Power can be stored for later usage – The system’s battery pack can store power, whereas a fuel-powered generator can only provide power while running. 10. Utility companies will pay for your excess electricity – If you expand the setup by adding enough panels, you can route the excess power to your city’s grid and receive a check from the utility company every month instead of having to pay them. What Do You Need to Know Before Buying One? Most solar generators generate just enough electricity to power household appliances for several hours at a time. However, some of the more powerful systems can be used continually and are expandable, allowing you to add more panels to increase your solar energy production capabilities. The main job of a solar generator is to harvest radiation from the sun’s rays, process it through an inverter to produce an AC output, and store the captured energy in a deep-cycle battery setup. While not all models include all of the above components, this list describes an optimal feature set for a well-equipped solar generator. Aside from the main components, there are a number of additional features that vary greatly depending on the model. Any model that comes with all of the features listed below would be an ideal choice, as long as it meets your wattage requirements. These perks are what distinguish the different solar systems from each other. By taking the above features into account before conducting your final comparison, you’ll know exactly what you’re looking for beforehand. Be sure to note the overall quality of the materials used in each component and see if there are any complaints regarding functionality or durability by reading our solar generator reviews. Researching each component individually to determine which type you’d prefer can also help you prepare for the shopping around process. After learning about the above components you’ll be knowledgeable enough about the system to make an informed decision. How To Buy The Best Solar Generator For Your Needs? included components – Note that you will rarely find the solar generators which come with the panels included since. You have to purchase them separately in most of the cases. The output wattage of the solar panels is primarily what determines how much electricity you’ll be able to capture at one time. Be sure to check the power rating of the inverter as well; a higher power rating means the system can deliver more electricity at once. In most cases, you can expect to charge only 1 small device at a time such as laptop, smartphone or GoPro camera. 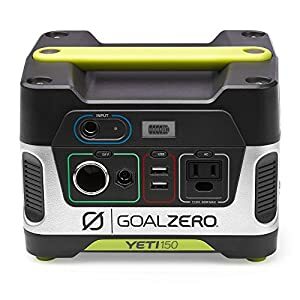 Don’t expect to use most of the portable solar generators mentioned in this guide to power up larger appliances unless you go for a larger generator such as Goal Zero Yeti 1250. To determine how many watts of output you’ll need to power all of your devices/appliances simultaneously, check the labels to determine the peak watts per hour, which is the amount of electricity it uses when all features are enabled. Always use peak usage numbers to calculate your solar energy needs when adding up the power usage of multiple appliances. 1. Determine average daily or monthly usage – By dividing the monthly average usage amount (shown on your utility bill) by 30 you get your average daily usage amount in kilowatt-hours (kWH). You can also use an electricity monitor to determine a more accurate rate. 2. Add a cushion to your daily average – Next, add a 25% cushion to your average usage to account for the fact that solar panels are not always 100% efficient in all weather. 3. Choose a system with sufficient solar output – After determining how many watts you need, choose a system that accommodates your needs. You might need to go with an expandable system and add too it to reach your desired output level.